You can read plenty more about ASHA elsewhere, but to help readers of this blog briefly understand the background, here's a brief summary of the charity that we're volunteering for. 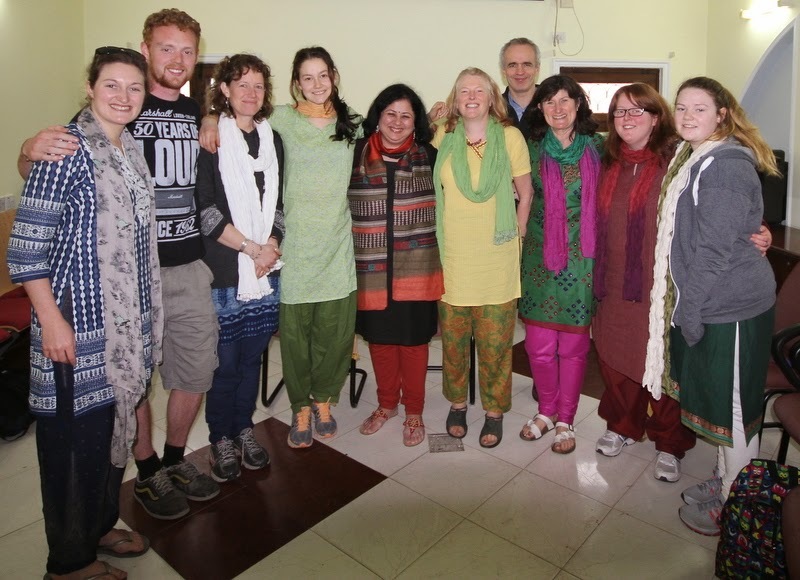 The Greystones group of volunteers is pictured below with Dr Kira Martin, the founder of the organisation. The story is an inspiring tale: Dr Martin, was sent to the slums to treat an outbreak of cholera back in 1988, as a young paediatrician. She set up a treatment table under the shade of a tree in the slum, and she soon realised that much more help was needed than just medical care. She noticed that the women were not allowed out and about: they stayed indoors, while the men went to work. She decided to meet some of these women, and then she set about empowering them as active members of their community. She chose several women from each laneway, and they had to check in on all the other families along their street every day, and then to report any problems to ASHA. She taught these “lane volunteers” about basic health care and diet, and they then went on to educate the other women in their area. The lane volunteers began meet regularly as a group called the “Mahila Mandal”(Women's Association), which over time became a recognised voice speaking on behalf of the slum residents, negotiating with the slum lord (the de facto boss of the slums) and government officials, working to improve intrastructure such as drains, power and road surfaces. Dr Martin also realised that finances were a challenge for slum dwellers, so she negotiated with local banks to allow them to open “zero” bank accounts without the usual need for identification, utility bills, credit record etc. This allowed the women to save in small amounts, and to take out loans and to set up small businesses: the “lane volunteers” kept an eye on repayment schedules to ensure that people didn't fall behind, and to date, the repayment record of ASHA loans is dramatically better than the national average in India. Dr Martin could also see that slum dwellers saw no possibility of ever escaping their circumstances: to change that, she started to set up educational support schemes for the children in the slum. The Indian government does offer free primary school education nearby, but ASHA follows this up with homework-club type post-school classes, as well as supporting them financially through secondary school, and in recent years, even through university. Thanks to ASHA, since 2008, 600 slum children have passed through university, and many are now working in white-collar jobs – a situation that was previously unimaginable. Dr Martin started in one slum, but was so successful that ASHA now runs similar schemes in 55 slum colonies, serving 400000 people (around 10% of the total slum population in Delhi.) The organisation is ambitious and successful, with the focussed aim of bringing about lasting improvements in the lives of slum dwellers. We've now arrived in Delhi and are settled in: watch this space for regular blogs about how we get on.